The Haryana Chief Minister, Mr Om Prakash Chautala, said here yesterday that he planned to convene an all-party meeting at the national level after the ensuing Assembly elections to discuss the role of the Election Commission in preventing the elected governments from undertaking development works under the garb of the model code of conduct. The Haryana Government slapped a charge-sheet on the suspended Financial Commissioner and Principal Secretary, Finance, Mr Bhaskar Chatterjee, today, according to informed sources. The Haryana Assembly Speaker, Mr Satbir Singh Kadian, has sent a notice of the breach of privilege given by the Independent MLA from Ambala cantonment, Mr Anil Vij, against two police officers to the government for immediate comments so that further action could be taken against them. Mr Umed Lohan, Indian National Lok Dal candidate for the Barwala Assembly seat and state president of the youth wing of the party, today sought anticipatory bail in connection with the murder of Kulbir Singh, driver of Congress candidate Randhir Singh. In a sensational incident, land worth crores belonging to Mission Compound in Ambala City was allegedly fraudulently sold off at a throwaway price. A case has been registered against a resident of Ludhiana, C. Bansi Lal, and a few others at the Baldev Nagar police station here. Sub- inspector Lekh Ram, one of the main accused in the case pertaining to the custodial deaths of Sita Aggarwal and her daughter, Sarika Aggarwal, at the Dharuhera police station in this district, has now been notified as a proclaimed offender by a CBI court of Ambala. Delhi Public School in Himshikha Colony here has developed a science park to explain various scientific concepts to the students. 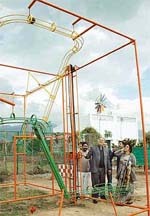 Addressing a press conference, school principal, Samson Masih, and trustee Dr B. Arora said the park had been developed with the help of a Chennai-based consultant. “The idea is to ensure that the children learn scientific concepts through hand- on experience,” they said. Kuchhal, an engineering college student, was killed in a road accident near Bharat Hospital in a Haryana Urban Development Authority (HUDA) colony here last night. A 30-year-old migrant woman allegedly committed suicide by throwing herself before a running train near Asandh flyover along with her two daughters today. The police has provided more security to the main witness, Sanjay, in a case relating to the murder of Israna market committee chairman Dayanand Jaglan and his son Harender last year, after an attempt to kill him on Wednesday night. The Haryana Excise and Taxation Commissioner, Mr S.N. Roy, has issued instructions that no liquor vend or hotel or restaurant or club or any other establishment will sell or serve liquor anywhere in Haryana on February 23, the day of counting of votes for the Assembly elections in the state. Talking to newsmen he said he would also press for a review of the code. Launching a scathing attack on the Election Commission, Mr Chautala alleged that it had become a “tool of the Congress.” He said retired bureaucrats who became members of the EC for six years, wanted to get some slot after the expiry of their term as the former Chief Election Commissioner, Mr M S Gill, had done. He said Haryana had been targeted by the EC and its Observers, who did not dare to visit Bihar and Jharkhand. They visited this state because “they( the Observers) were comfortable here.” He went on to allege that the observers sought discretionary quota plots of the Haryana Urban Development Authority (HUDA). However, he did not name any such Observer, saying that he would disclose the full facts after the counting of votes. Mr Chautala, who is currently engaged in a confrontation with the commission over suspension of a top bureaucrat and the ban on appointments, said by its undue interference, the panel had now replaced the democratically elected state governments. ‘’Elected governments have ceased to exist and the Election Commission is ruling,’’ he added. Questioning the supremacy of the commission, Mr Chautala said its biased and unrestricted interference was a danger to the democratic set-up in the country. In a defiant tone Mr Chautala said his government would not mind violating the code of conduct, while giving assistance to farmers affected by the recent hailstorm in the state. Due to the restrictions imposed by the commission, he claimed, the development work in Haryana had come to a stop. The state exchequer was bearing a loss of crores of rupees and the Central assistance had stopped. There would be a cut of at least Rs 500 crore in the state plan next year. The monthly wage bill of Haryana employees, who have been rendered workless due to the code of conduct, amounted to Rs 425 crore and, therefore, the state had incurred a loss of Rs 1700 crore during the four months affected by the elections. He said despite having surplus power, the state government could not even supply power to the villages where transformers had broken down. As per the EC guidelines, the state could not float new tenders to purchase transformers till the model code of conduct was in force. The Haryana Government slapped a charge-sheet on the suspended Financial Commissioner and Principal Secretary, Finance, Mr Bhaskar Chatterjee, today, according to informed sources. Mr Chatterjee was placed under suspension by the Haryana Government on February 14 for allegedly “wilfully not implementing the orders passed by the competent authority”. Though the government did not specify which orders were not implemented by Mr Chatterjee, it is believed that the matter pertained to colonisation licences. The three-page charge-sheet served on Mr Chatterjee is believed to have asked him to explain that when the Legal Remembrancer had given his opinion on the file, why he (Mr Chatterjee) had sent the file to the Chief Secretary instead of the Chief Minister as laid down in the Rules of Business of the state government. It is learnt that before suspending Mr Chatterjee, the government had sought the explanation of the Director, Town and Country Planning, Mr Alok Nigam, also. The sources say it was only after Mr Nigam had replied that the government decided to place Mr Chatterjee under suspension. The government has also charge-sheeted two HCS officers, Mr Jagdeep Singh and Mr Sandeep Singh, sons of the Haryana Education Minister, Mr Bahadur Singh, for allegedly violating the code of conduct for government services. The two brothers were accused by the Congress of campaigning in support of their father in Bhiwani district. The Election Commission had also sought action against the two brothers. In his notice Mr Vij had alleged that certain persons unlawfully tried to evict a handicapped person from his rented shop in Ambala cantonment on January 1 last. When the incident came to the notice of Mr Vij, he reached the spot where the people had collected in a large number. They demanded action against the guilty. The police, however, was indifferent and did not lodge an FIR despite repeated requests of the MLA. Mr Vij along with his supporters sat in dharna outside the Sadar police station, which continued for about eight hours. The ASP, Mr Y. Puran Kumar, came on the scene with heavy police force. The police allegedly used force to disperse the crowd. However, the dharna was lifted only after the ADC, Mr M.L. Kaushik, assured the crowd that action would be taken against three police officers, including Mr Puran Kumar, and an FIR was lodged against those who had tried to evict the tenant. Mr Vij alleged that the police officials nursed a personal grouse against him since then. On the night of February 2, Mr Vij said in the notice, a vehicle (HR-01P 0790) followed his vehicle for more than one hour. When the MLA reached his house, the vehicle allegedly tried to run over him. He alleged that four persons came out of the vehicle with weapons and attacked him, fracturing his right hand. The police officers, he alleged, in connivance with the attackers lodged a false complaint against him, his family members and his supporters, instead of taking action against the alleged attackers on the basis of the FIR lodged by the MLA. Though the suspects were arrested, they were released allegedly at the instance of the ASP. The police lodged two different complaints, with contradictory versions, against the MLA at two different police stations. In his request filed in the court of Additional Sessions Judge Shiva Sharma, Mr Lohan has maintained that he had been falsely implicated in the murder case of the driver. He has expressed apprehension that he could be arrested by the police in connection with the case. After listening to his plea, the court issued a notice to the government and February 22 has been fixed as the next date of hearing. Meanwhile, the court of Judicial Magistrate Ashwani Mehta today reserved its verdict on the cancellation of non-bailable warrants issued against local Congress MP Jai Prakash till tomorrow. In a sensational incident, land worth crores belonging to Mission Compound in Ambala City was allegedly fraudulently sold off at a throwaway price. A case has been registered against a resident of Ludhiana, C. Bansi Lal, and a few others at the Baldev Nagar police station here. The case has been registered for illegally selling land whose market value is said to be more than Rs 50 crore at a price of Rs 38 lakh. The transaction allegedly took place on the basis of forged documents. The Chief Judicial Magistrate, Ambala, Ms Kanchan Mahi, had yesterday directed the police to register a case against C. Bansi Lal and others on a complaint filed by three persons. The complainants had alleged that C. Bansi Lal, in connivance with some other persons, had sold the land measuring around 14 acres on the basis of a false power of attorney. The Director of the Mission Hospital, Dr Sunil Sadiq, had also filed a complaint with the SP, Ambala, in this regard. Dr Sadiq said Bansi Lal had no legal right to sell the land. He said he would challenge the power of attorney in the court. The Mission Compound land is a prime piece of property located in the heart of Ambala City. The sale of the land had come as a shock to the mission officials. Following this development, Dr Sunil Sadiq immediately informed the SP, Ambala, Mr M.R. Kiran. In the meantime, they also approached the Chief Judicial Magistrate, Ms Kanchan Mahi. In the submission made to the court, it was claimed that a forged power of attorney had been prepared and the land was collectively sold to three residents of Barara, a resident of Subhri, a resident of Nahouni and a resident of Patiala. It was also claimed in the court that an official was also involved in the land scam for carrying out the registry. The notification has come in the wake of the reported failure of the authorities to execute a non-bailable warrant issued in December 2004 against the accused SI by the CBI court. It may be mentioned that soon after the issuance of the non-bailable warrant, Sub-inspector Lekh Ram, who was then the SHO of Rohrai police station at Palhawas in this district, had been sent to the police lines by the district police chief. Delhi Public School in Himshikha Colony here has developed a science park to explain various scientific concepts to the students. Addressing a press conference, school principal, Samson Masih, and trustee Dr B. Arora said the park had been developed with the help of a Chennai-based consultant. “The idea is to ensure that the children learn scientific concepts through hand- on experience,” they said. The school principal said the park would be formally inaugurated on February 20, which would be followed by Sci Fest, where more than 50 schools of the region would participate. It is learnt that a Kuchhal was going on a motor cycle when he was hit by a vehicle. He sustained serious injuries after he fell on the road. He was packed up by some passersby and taken to a private hospital for treatment. He was given first aid and referred to a trauma centre in Delhi where he succumbed to his injuries. The police has registered a case against the driver of the unknown vehicle. Neither the woman nor her children could be identified. The railway police took the bodies into possession and sent them to Bhim Sen Sachar hospital for post-mortem examination. More than 10 persons attacked Sanjay’s Luxmi Nagar Colony house on Wednesday night. Some of them fired several shots at his house. However, they fled after 10 minutes when Sanjay’s brother Bhoop Singh retaliated. A case has been registered. He said liquor vends would put their shutters down and remain locked during the day. The Chief Electoral Officer of Haryana had directed that no liquor vend, hotel, restaurant, club would be allowed to sell or serve liquor to anyone on the counting day, Mr Roy said.